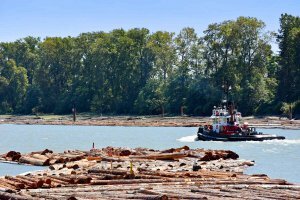 The River District is a sought after up and coming neighbourhood along the Fraser River in Vancouver, British Columbia, Canada. With sweeping views of the Fraser River from many of the homes, it's the most affordable waterfront property in Vancouver! Enjoy miles and miles of waterfront walkways and biking trails running from approximately Knight Street bridge to Boundary Road, and then the trail continues to Burnaby's Foreshore Park trails. Along the walkway, you'll enjoy picnic areas, playgrounds, tennis courts, community gardens and much more. 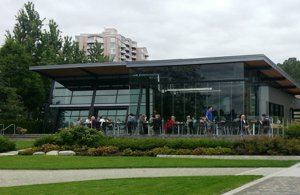 Enjoy lunch, dinner or weekend brunch at Romer's Burger Bar either inside or on the fantastic waterfront patio, or partake in one community events at the River District Presentation Centre, or the Saturday Farmer's Market. The central location provides easy access to Downtown Vancouver, 5 minutes to Richmond, 10 minutes to Metrotown, and minutes to Fraserview Golf Course (and hiking trails), Champlain Square, Superstore and more. The River District is planning on creating 25 acres of greenspace, and continues to evolve with new homes and shops being added every day. Romer's Burgers, Starbucks, Everything Wine, Westminster Savings and TD Bank are now open. SaveOnFoods is scheduled to open in 2018 and more shops and amenities planned to open over the years. There's a lot going on in this thriving community by the River! 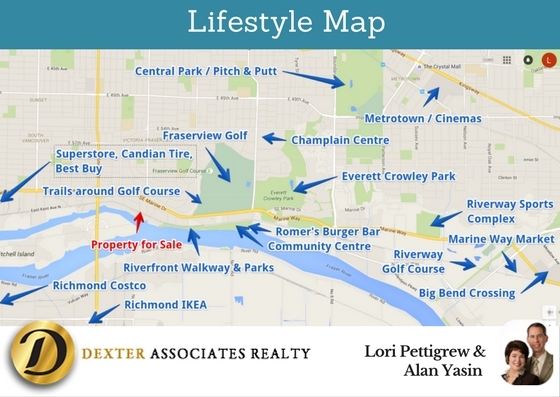 View all Vancouver neighbourhoods or current River District Market Report.